Atlanta, GA – April 6, 2011- Dr. Susan Rudnicki is a featured expert in this month’s Atlanta Parent Magazine in an article about child beauty pageants. Below is the text or read the online version here. Entering young girls in pageants raises a lot of tough questions. Here, Dunwoody-based clinical health psychologist Susan Rudnicki, who specializes in teen problems and women’s issues, addresses the benefits, downsides and stigmas associated with children’s beauty pageants. What are the benefits of pageants for young girls? Pageants can provide a forum to enhance young girls’ self-esteem and sense of confidence by exploring their wonderfully diverse personality assets. They can help guide girls to strengthen their cognitive skills, physical development and overall social grace and poise. Downsides to pageants occur when the emphasis is placed solely on external beauty. Then a young girl learns only to value beauty on the outside; missing a valuable lesson that true beauty flourishes from the inside out. Girls who value merely external beauty tend to be unhappy, unsatisfied and subsequently have difficulty with establishing healthy interpersonal relationships with others due to their limited sense of self. Do pageants put too much emphasis on beauty, hair, makeup and clothes? There is absolutely too much emphasis on external characteristics of beauty, rather than internal beauty traits. A healthy approach would be to focus more on talent and skills, community service, intelligence and academic achievement. How should parents de-emphasize these things? Parents should primarily provide positive reinforcement and verbal praise for acts of kindness (such as helping a friend with homework or completing chores without being asked), achieving good grades and thoughtful problem-solving when she confronts adversity in life. Parents should also be encouraged to compliment their daughter’s beauty in her most natural states – when she just wakes up in the morning or when she gets messy during playtime. On stage with “Pageant Perfect” hair and makeup should not be the only time a girl feels or is told she is beautiful! Do you think parents who encourage pageants are exposing their young girls to unnecessary dangers, such as stalkers and pedophiles? Not necessarily. In today’s social media- driven world, there is always online access for predators. Parents should keep an open dialogue with their kids about these types of dangers and monitor Internet access accordingly. As always, parents need to heed caution and practice good judgment about whom they allow to supervise their daughters when they are not present. Where do parents draw the line between constructive and hurtful criticism? The result of hurtful criticism is shame, embarrassment and guilt, leading ultimately to self-sabotaging behaviors. Rather than continuously pointing out to children what they are doing wrong, either through caustic verbal exchanges or disappointed facial expressions, parents can optimize their children’s potential and personal assets with constructive feedback. This philosophy is best described as verbal praise and nonverbal reinforcement (smiles, hugs) for positive behaviors, coupled with supportive direction for behavioral change when addressing personal limitations. What if your child does not want to participate but you have spent all this money on clothes, coaches and hair? Listen to your child and allow her to dismiss herself from the pageant. The focus should not be on money lost but on lessons learned in the process, including what interests your daughter chooses to pursue in life. If you force her to participate, then you deliver a detrimental message that your daughter is controlled by money, rather than on a well-grounded exploration of personal desires and interests. 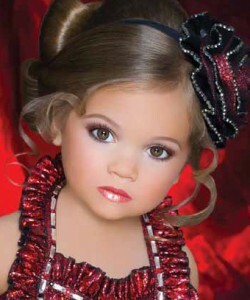 What questions do you as a parent need to ask yourself before getting involved in pageants? Parents need to ask themselves the real reasons behind their desire to participate. Does their daughter truly want to compete in a pageant? Or is this a way to live vicariously through their daughter to fulfill the dreams and experiences that they didn’t have as children? When a parent is driving the desire and the decision to participate, this can lead to an unspoken message that the child is responsible for the parents’ happiness. On the other hand, if the child shows a genuine desire to be involved in pageants, parents can support and guide their daughter through the process in a healthy way. Whether or not their daughter walks away with a tiara and title, she can still benefit from a positive pageant experience! This entry was posted in Family, Fatherhood, Motherhood, Society. Bookmark the permalink. Post a comment or leave a trackback: Trackback URL.